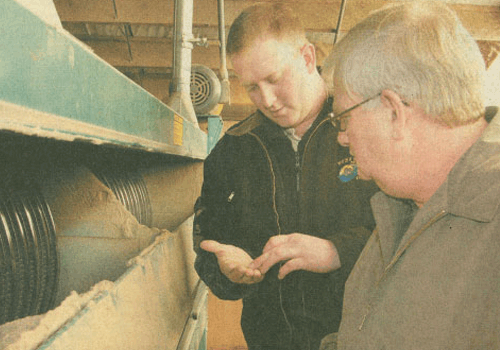 Pictured above: Brandt Hayden; left, pulls seed out of Oregon Seed Cleaning’s processor in Brooks to check the machine’s performance with Dwayne Hayden, president of West Coast Seed Mill Supply. The company works with 25 to 30 American seed-processing manufacturers to help growers and other customers clean, sort and size hundreds of products. This article first appeared in the Capital Press. SALEM – Since his boyhood days on a northeastern Montana’s wheat and sugar beet farm, Dwayne Hayden has been at home with seeds. Today, Hayden is still at home with seeds but as presi­dent of West Coast Seed Mill Sup­ply. At West Coast Seed Mill, Hay­den works with 25 to 30 Ameri­can seed processing equipment manufacturers to make sure he has a supplier that can handle any seed need a grower might come up with. The list of seed and non-seed items the Haydens are called on to help with is long. It includes every kind of grasses, flowers, veg­etables and grain. It includes pow­dered onions, garlic, spices, cof­fee beans and nuts. There are also lavender, meadowfoam and mint or peas, beans and pumpkin seeds. Hayden moved to the North­west in 1988 in search for a warmer place to live. “I managed several ag busi­nesses in northeastern Montana up near the North Dakota border until I decided to move where the winters weren’t so cold,” Hayden said. “I still have to go there to meet with customers but at least I get to come home. I call on grow­ers in Western Montana and Wyoming, Northern Utah, Neva­da, Idaho, Washington and Ore­gon. Brandt Hayden, who shares his dad’s enthusiasm for solving all problems of feed and seed pro­cessing, is a former college baseball player with a business and economics degree. The company occupies a farmhouse that has both office and shop space. “When I started in the sales business in 1988, I was given a map and turned loose,” Hayden said. “Today I have sales representatives in Idaho Falls and Junction City, my daughter Mer­rissa goes to college and works part time in the office and Brandt is now part of the company.